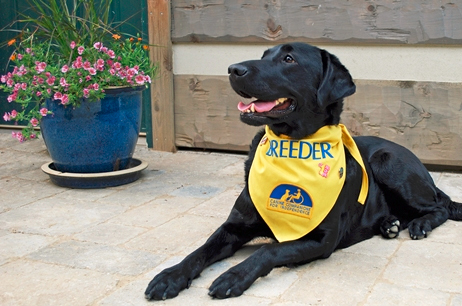 In 1988 our family started with Canine Companions by raising the first of eight puppies. Little did we know how our family life would be significantly changed…..all for the better. We learned first-hand that highly trained assistance dogs can greatly improve the lives of persons with disabilities. We’ve observed that with a Canine Companions dog, the person’s physical abilities are dramatically changed, but the real value is the mental / emotional improvement. Confidence and determination are dramatically improved, particularly with young people when accompanied by a Canine Companions dog. They will try things, and accomplish them, with the assistance of their Canine Companions assistance dog, that previously would never be tried. This leads to a very dramatic increase in self-confidence and positive attitude for the future. The love and trust shared between the team (person + dog) is indescribable. What a life-changing gift a puppy raiser provides someone they don’t even know!! It changes the attitude of the puppy raiser forever. The experience is like wrapping up a gift for someone! It positively affected my family so much that 25 years later we are still very actively involved with the organization, and plan to continue long into the future. Get on-board; you’ll NEVER regret it! If you can’t be a puppy raiser, be a financial contributor as each Canine Companions assistance dog is provided free of charge to its human teammate. You can contribute in many different but all very important ways.